Motherhood. It changes you. Not a profound statement I know, but I’m learning a lot along the way here. Lately I feel bombarded with “fit” friends. I get swamped with invites to try all these work from home things from other moms. I’m not sure if they just forget I already do work from home. I worked from home LONG before I had my daughter. A lot of mothers it is a dream come to true to begin making money from home. For me it was a shock to work around another little human while trying to work from home. I’m glad that other mothers are finding their way and their place in motherhood. Lately I feel this sense of needing to do more and it overwhelms me. I’ve been an entrepreneur for quite some time. I understand women being self employed. I understand self employed women working along side men. I understand presenting yourself, selling yourself, customer service and a slew of other core principles of business. Something I’m failing to grasp is this idea of “showing” these things to your toddler. I’m missing the point of how dedication to working out is teaching your daughter about a good body image. If anything I feel like it shows my daughter she needs to workout in order to look good. I got on my workout kick post pardum and lost my baby weight and felt great. I quit working out though and I still feel great. We don’t eat like crap, but we don’t buy organic all the time either. 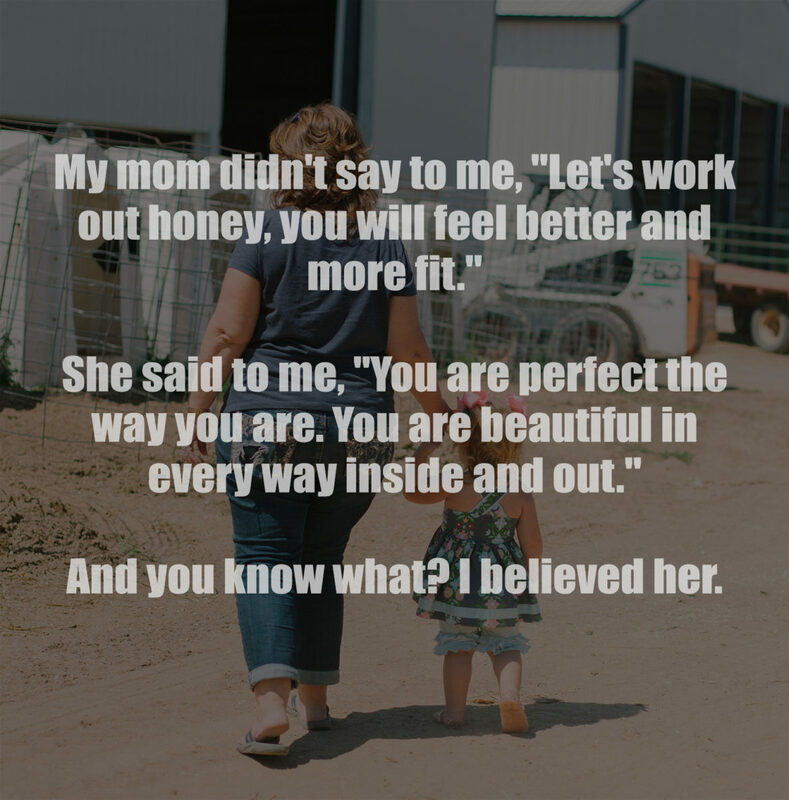 I struggle with my daughter having memories of “my mom and I worked out together”. It just doesn’t make sense to me. I have been told confidence is taught. Perhaps I just have a lot of it and I hope to pass it on. Much harder areas for me are showing my daughter grace, patience, humbleness, a willing heart, a loving spirit…to be consistent with her in all these areas is the greatest challenge I have yet to face. I know one might argue physical fitness changes your attitude, and while I agree to a certain degree, I think forms of that can be very different. We are nature people. We are barefoot people. I’m not crunchy but I do agree that dirt offers minerals and vitamins. Being grounded with our surroundings and things that are not man made and only from God are things I want my daughter to see. Eating healthy by growing your own food instead of shopping by “organic” labels in the store. I think all girls struggle with their body during the teen years. You are just more aware of your body changing. My mom didn’t say to me, “Let’s work out honey, you will feel better and more fit.” She said to me, “You are perfect the way you are. You are beautiful in every way inside and out.” And you know what? I believed her. I still believe her. I hope my daughter believes me. I hope she finds her worth in Christ. I hope she casts her cares on him. I hope she doesn’t put her worth into her workout. There. I said it.